When stars run out of fuel at the end of their lives they can no longer support themselves and collapse under their own weight. This collapse is so violent that a tremendous explosion, which we call a supernova, is produced, blowing away much of the original star’s matter and resulting in a compact object. 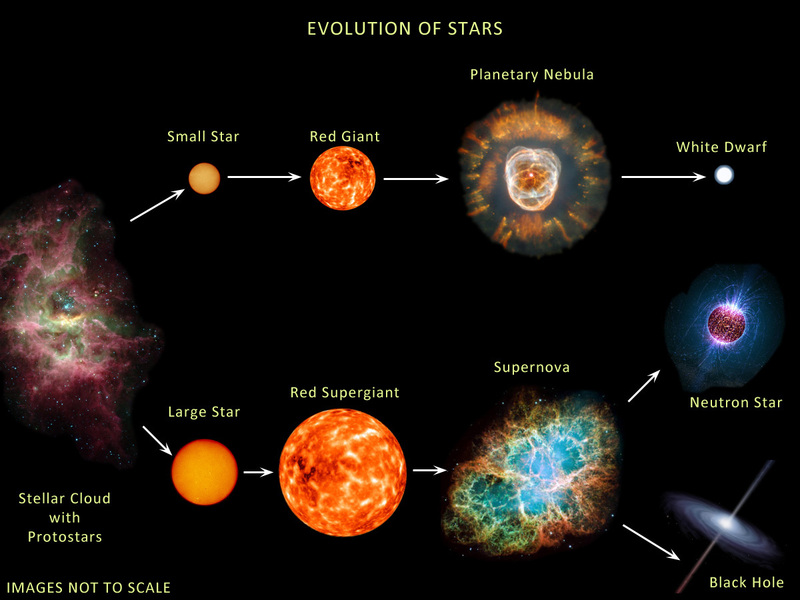 If a star with a mass greater than roughly twenty times that of our Sun’s goes supernova then the resulting compact object is so dense that it collapses into a single point. This is a black hole (see Fig. 1). 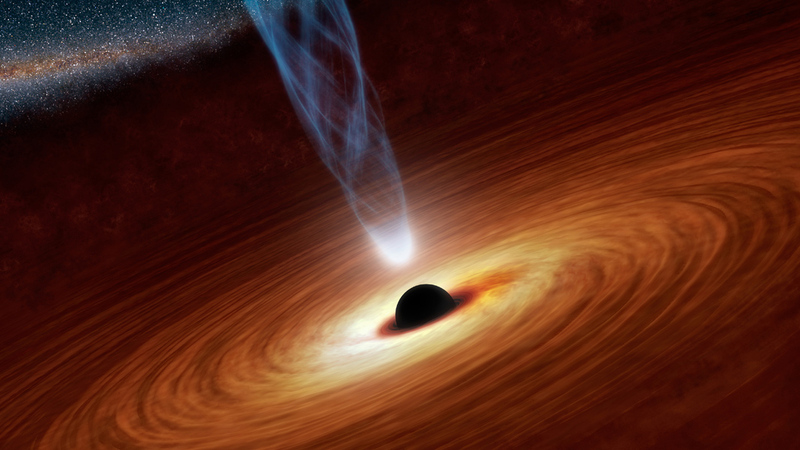 Black holes possess gravitational fields so strong that nothing, not even light, can escape. The event horizon of a black hole is the point of no return: any matter or radiation passing through this one-way membrane is forever trapped. The biggest black holes in our Universe have masses between a few million times that of our Sun to in excess of ten billion times the mass of our Sun! These are known as ‘supermassive black holes‘ (see Fig. 2). It is now believed that most (perhaps all) galaxies, including our own (Sagittarius A*), harbour a supermassive black hole at their centres. Fig. 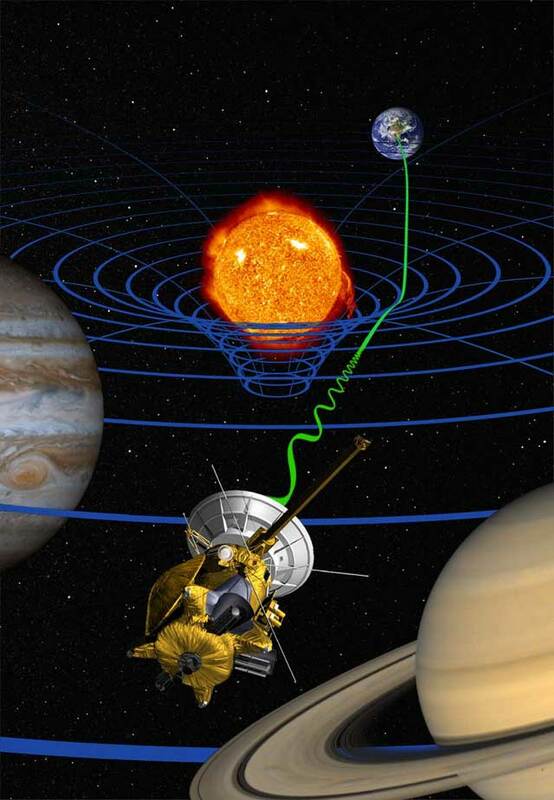 3: High-precision test of general relativity by the Cassini space probe (artist’s impression): radio signals sent between the Earth and the probe (green wave) are delayed by the warping of space-time (blue lines) due to the Sun’s mass. Image courtesy of NASA/JPL-Caltech. Although black holes are a hot topic in contemporary Astrophysics, the notion of an object so massive that not even light can escape was first put forward by the Rev. John Michell in 1783. These objects became known as “dark stars”, but were disregarded for over a century, since at the time it was not understood how light (which has no mass) can be influenced by a gravitational field. It was not until 1915, when Albert Einstein presented his theory of general relativity, that it was understood that light rays can indeed deviate from straight line trajectories and be curved under the influence of gravity (see Fig. 3). The following year a solution to the Einstein field equations of general relativity was found by Karl Schwarzschild which described what would later be understood as a black hole. Fig. 4: Animation of the shadow (outlined in red) of a maximally spinning black hole. The event horizon (blue), interior to the shadow, is unobservable. The observer starts by looking at the black hole from above (i=0°), moving to looking at it edge-on (i=90°). If the black hole were not spinning the shadow would not change shape at all. In principle, measurement of the size and shape of this shadow allows us to extract information about the mass, spin and relative orientation of the black hole. Our current knowledge of black holes is inferred through light emitted from extremely hot material falling into the event horizon. This in-falling material forms an “accretion disk” which can almost touch the event horizon if the black hole is rotating rapidly enough. Whilst direct imaging of a black hole is impossible since light cannot escape, by observing its gravitational influence on nearby matter and radiation we can infer its properties. Moreover, a black hole’s presence may also be inferred through the shadow its event horizon casts on the background sky (see Fig. 4). My PhD work at MSSL has focused on creating and running my own numerical codes to calculate how black holes modify the light rays (radiation) that are emitted from the hot in-falling (accreting) matter in their vicinity. As radiation passes through matter around a black hole it may be absorbed, emitted and scattered before finally reaching us here on Earth. This interaction modifies the radiation, leaving an imprint of the material the radiation has traversed. This is applicable to all types of radiation flux, including flux in the form of neutrinos and even gravitational waves. As such, radiative transfer is a powerful tool for extracting information about matter from observations of its radiative emissions. Using millions of these light rays as pixels we can construct images of what an accreting black hole looks like from different viewing angles. We can also study this light in the form of an emission spectrum, which has a very distinctive shape. The size and shape of these images can tell us a lot about the mass and spin of the central black hole, as well as give us some insight into some of the more bizarre aspects of general relativity! Fig. 5: Movie of an accretion torus around a maximally spinning black hole (main) and the corresponding calculated emission line profile (inset). The accretion torus is coloured by relative energy shift: red corresponds to radiation which has lost energy while escaping the deep gravitational potential well of the black hole, and conversely blue to radiation which has gained energy. White/gray indicates radiation which has undergone no net change in energy. The black hole is rotating in an anti-clockwise direction. For example, the shape of the toroidal (akin to a donought) accreting material is distorted and gravitationally lensed (see movie in Fig. 5). The gravitational influence of the black hole is so strong that at inclination angles close to 90 degrees (i.e. viewing the black hole edge-on) both the underside and upper face of the rear of the torus are visible. This is because light rays emitted from the far side of the torus are curved back towards our field of view, akin to us being able to see the back of our own heads without a pair of mirrors! The series of concentric rings towards the centre of Fig. 5 are light rays which orbit the black hole multiple times before escaping. The innermost ring is the black hole shadow, as in Fig. 4. The emission line profile in Fig. 5 becomes highly asymmetric and double-peaked as our view is moved to edge-on. This is because those light rays which escape and reach us have been strongly curved by the black hole’s gravity and are strongly red-shifted and blue-shifted. Fig. 6: Movie of a translucent, radiation-pressure dominated accretion torus which incorporates the effects of absorption, emission and scattering of radiation. Hotter regions are white, cooler, less-energetic regions are dark-green. While these calculations give us a nice qualitative and phenomenological view of black holes and accretion, they are still quite simplistic. In considering a more realistic description of how matter and radiation behaves in the vicinity of a black hole we must also include more detailed microphysics into the description of the radiation and matter, as well as how they interact. This includes calculating the opacity of the accreting matter to radiation, including the effects of radiation pressure, and how light is emitted, absorbed and scattered (see movie in Fig. 6). Fig. 7: Movie of the relativistic Compton scattering kernel as a function of initial photon energy. As the energy of incident radiation becomes much greater than the relativistic electron, the range of possible scattered energies increases. However, when the accreting material close to the event horizon becomes optically thick (i.e. opaque), scattering effects dominate and must be treated explicitly, the most important of which is Compton scattering of radiation by relativistic electrons. This presence of a black hole significantly complicates the mathematics needed to calculate this effect. I recently wrote a code to calculate Compton scattering around black holes analytically for the first time. The key result of this work is the scattering kernel. This tells us the distribution of energies scattered radiation of a given energy can have, as a function of its energy prior to scattering and the energy of the electron it scatters off (see movie in Fig. 7). Such calculations are essential first steps in self-consistent, physically-realistic treatments of the behaviour of matter and radiation around black holes. The first calculations concerning emission from black holes date back to the 1970s. With the advent of high performance computers and advances in numerical computation we are now able to study black holes in extraordinary detail. Until now these calculations have remained just theoretical predictions. However, in the next few years, we will soon see the first image of the shadow of a black hole event horizon! Current and future submm-VLBI radio telescopes, including the Event Horizon Telescope (EHT) project, Greenland Telescope (GLT) project and BlackHoleCam project, will soon be able to do just this. We will then be able to compare our theoretical calculations with these observational data, and probe the detailed physics (and microphysics) of black holes, as well as their more global properties, in exquisite detail. In summary, I hope that this description of my research has given a flavour of black holes and the important role numerical radiative transfer calculations play in unravelling their mysterious behaviour. We live in exciting times, and we will soon have observational confirmation of whether black holes (as we currently understand them) do exist!